Core information for anyone interested in running a 17th-century game using D20 rules, and certainly if Sword's Edge Publishing's Modern Mediaeval line appeals. Publisher's blurb: "d20 has offered more than one rule set, each with specific areas of use. These rules are interchangeable to a great degree, and the Modern Medieval line takes the modern rule set for use in a pre-industrial setting. 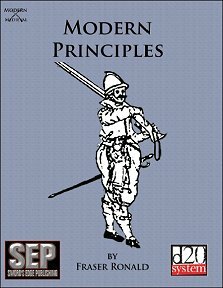 Modern Principles is the primer for Sword's Edge Publishing's Modern Medieval line. Here you'll find skills, feats, and even a few rules variants for using modern rules in fantasy games." Thanks to Sword's Edge Publishing for making this available! Available FREE from the Sword's Edge Publishing website, click HERE to get your copy.